Your journey starts here with 10 days to all things better adulting. 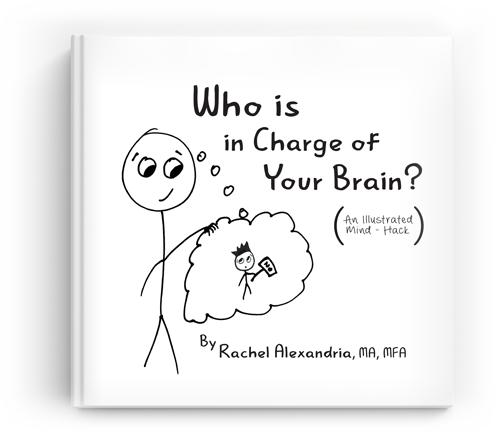 This is a journey that began with my illustrated book “Who Is in Charge of Your Brain?“! If you read it, you’re probably wondering what comes next. How can you put this information into practice so you can stop being abused by your inner critics and hear your own deep wisdom more clearly? Your new beliefs need support to take root. I like to put up post-it notes of positive reinforcing statements, prayers, and quotes. Here is a starting statement I recommend you read to yourself daily, or post by your laptop, or screenshot and use as a phone background. I welcome compassionate self-awareness. The more I notice without judgment, the more I create space for positive change. Feed your mind a steady diet of healthy thoughts using guided meditations. The meditation below is a short beginner track that will train your brain to be calmer and let go of rigid thinking. As you listen, you will start to reclaim your emotional and mental space. I recommend listening at least a couple times a week to make some progress. You can return to this page to listen to this meditation, or if you wish to download it directly, add this item to your cart and then use the code “journey” at checkout. Subscribe to my free sampler series, 10-Days to Better Adulting. You’ll get a message every other day with awareness-expanding info and practical tools to try out. At the end of the series, you will receive an exclusive invitation to get access to The 60-Day Adulting Revolution. The Revolution will drop thought notes and new experiments on you every other day, along with some inspiring and interesting video lessons, new meditations, and more. Let go of your lists of flaws and failures. Replace your blahs with bold self-confidence. Embrace Better Adulting so you can feel happier, healthier, and proud of the person you become.